"I bequeath to my nephew, Jacob Quigley, all that I own, all that I dream, and all that I am, in the hope that my life's quest will become his quest." Those few cryptic words send Jake into a bizarre world that couldn't possibly exist. Traveling the Gateways, he will befriend the Eternal Guardians and stand against an ancient enemy. top 10 finalist in an international screenwriting competition. 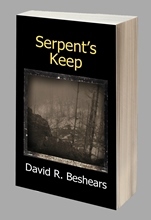 The long-awaited (and much requested) sequel to Serpent's Keep! The Six Temples on Amazon!